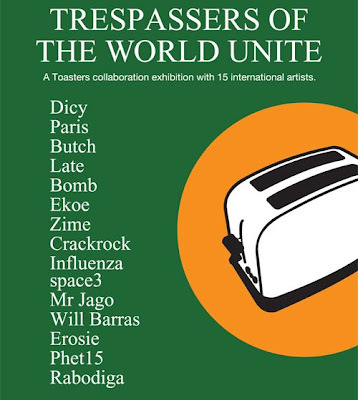 Tonight will see the opening of the Toasters show on Kingland Road hosted by Nelly Duff Gallery.The Toasters and fifteen of their fellow trespassers, some of Europe’s most influential artists from the world of street art, will come together for a collaborative exhibition aptly named "Trespassers of the World Unite"
The Toasters, one of the original pioneers of street art in the UK and globally, have entertained the streets since 1999, appearing on posters, banners, stickers and murals all over the world in Berlin, Stockholm, Los Angeles, San Francisco, Tokyo, Rio de Janeiro, Sao Paulo, Buenos Aires, Montevideo, Sydney, New York, Paris, Peckham... everywhere! Trespassers of the World Unite is a celebration of the last 10 years on the street for the infamous Toasters and a nod to those artists who they have respected over the years – hand picked through their long standing friendships. A total of fifteen artists are involved in this collaborative exhibition with The Toasters; Will Barras, Bomb Kid, Butch, Crackrock, Dicy, Eco, Erosie, Influenza, Mr Jago, Late, Paris, Phet, Rabodiga, space3 and Zime. The show will run until the 11th June.